My first reaction was frustration. Michael Vick‘s “rehabilitation process”? 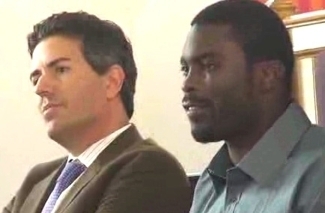 Why in the world should we spend one dime or one minute helping Vick win back a privilege he so willfully squandered? All rehabilitation efforts should go towards healing the dogs he tortured and maimed; no part of this is about nursing Vick back to health. And by the way, what dog deserves to be Vick’s guinea pig in his struggle to learn basic decency? Second: “Passion for animals”? What is he talking about? Until he starts speaking genuinely and with true remorse, I can’t take seriously one word he says. Mr. Vick, what have you ever done that shows a lack of cruelty towards animals, let alone fondness, let alone passion? We’re not idiots out here. Your statements are not only empty but insulting. Christina, my colleague and friend here at DogTime, is currently reading Jim Gorant’s The Lost Dogs: Michael Vick’s dogs and their tale of rescue and redemption. Every so often she’ll tell me where she’s at in the book. She describes it as ultimately hopeful – a beautiful tribute and testament to the resilience of my favorite breed, the Pit Bull. But she’s spoken about the darker parts of the book. She’s warned me that it’s not for the feint of heart. Working alongside animal control officers at municipal shelters, I’ve seen a lot of horrific cruelty. Burning, beating, intentional starvation – the lowest, most reprehensible acts of human behavior. I’ve read the court documents and the eyewitness accounts of Michael Vick’s own actions. But on Christina’s recommendation, I won’t subject myself to further angst by reading The Lost Dogs. A portrait of Vick’s repeated and deliberate acts of physical and mental torture is just too disturbing. So here’s my question to Wayne Pacelle: Other than knowing the whole world would be watching, what makes you think Michael Vick would treat an animal well? What makes you think there is any compassion, any understanding there? How does a prison sentence affect one’s attitude towards animals? How does a required speaking engagement prove sincerity? I don’t want to see Vick fail. It has nothing to do with forgiveness or second chances, but I want Vick to go all the way to the Super Bowl – heck, even win MVP. And that’s for one reason only: No one cares what a disgraced has-been has to say. His anti dog fighting message will only resonate if he succeeds on the football field. And it will only be taken seriously if he’s sincere. Right now I believe Vick is as genuine about his passion for animal advocacy as he is about his passion for crocheting. I don’t care how many schools he shows up at with a ball of yarn. It means nothing if there’s no action behind it. Michael Vick, stop telling us you love animals. Start doing something that shows you get it. Wayne Pacelle, your reputation is on the line.